At 3PL Center, we provide a comprehensive suite of public contract storage services. We have Grade A warehouses across North America that you can use while tapping on our third-party logistics expertise. When you use us for public contract storage, you can benefit from efficient truck or container unloading, and stellar pallet storage solutions. Whether you choose to route orders by lot or batch numbers, we will take it from there with the paper work. What’s more, you can enjoy easy usage of a robust web-based system where you can generate real-time inventory reports. The end result is that you can organize your business operations without hassle, as well as save money for your business. What is Public Contract Storage? To understand what public contract storage entails, we need to explain the two variations of this form of business storage: public warehousing and contract warehousing. Public Warehousing: You will be using warehouse facilities owned by a third-party provider, and the warehouse space will be shared between different customers like you. The storage space is offered under a lease agreement, usually month-to-month. The rates are commonly calculated on a fee per pallet system, or a fee per square foot. 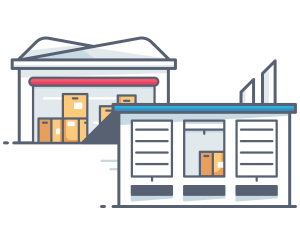 This option is best for those businesses with short-term warehousing needs, as it allows your business to use a distribution center without any large upfront investment. Contract Warehousing: The warehouse facilities are owned by a third-party provider, but the warehouse space will be usually exclusive to your business. The warehouse space is leased for a fixed term, usually six months or longer. Although the rates are still calculated on a fee per pallet system, or a fee per square foot, the fee will be much lower than the one featured in public warehousing. Contract warehousing also features more flexibility for your business as a range of value-added services (such as dock rentals and climate-controlled temperature facilities) will be available. Why Should You Choose 3PL Center for Public Contract Storage? With a combined experience of more than 45 years in the industry, we have developed top expertise in providing third-party logistics services, including warehousing. We manage premium-level warehousing facilities that come with the most current warehouse equipment, as well as hire professional and experienced warehouse employees to facilitate a powerful supply and distribution chain for your business. Not only that, all our warehouses feature a robust fire protection and security system, in addition to taking comprehensive pest control measures to provide absolute peace of mind when you choose us for your warehousing needs. You can be sure that our warehouses are compliant with environmental, insurance, and safety requirements. When you choose 3PL Center as your public contract storage, you can also enjoy the most advanced shipping and inventory capabilities that we have developed. Did we also mention that our public contract storage services come at the best market rates? We fully understand that the public contract storage niche is highly competitive, and that’s why we always believe in the implementation of fair pricing to benefit our customers and build customer satisfaction. Whether you are a small-sized wholesaler or large-scale global manufacturer, 3PL Center is able to serve you with the same level of passion and dedication for your warehousing needs. Our customer service team is available 24/7 so you can enjoy peace of mind, knowing that we are with you every step of the way. Ready to Get Started with Public Contract Storage? Give us a call at 732-391-2500 or email us at sales@3plcenter.com today for more information about how you can tap on our public warehousing capabilities or let us customize a contract warehousing plan for your business. How Many Orders Per Month ? How Many Unique SKU’s ? How Many Pallets or Cubic Ft per month do you store? How Does your Product Come in By Container, LTL, Small Parcel (FedEx,UPS)? Are you using a Shopping Cart? If so which? How many Pallets/Containers inbound per month? How many pallets being stored monthly?